If you’re considering a family vacation to Charleston, you’re in the right place! I hope the list below will serve as a helpful guide for the best things to do (and eat!) in Charleston, SC with kids! If it’s possible for a city to sweep you off your feet, that’s exactly what Charleston, South Carolina did to us the first time we visited over five years ago. Everything about the city–from the historic architecture to the big, sweeping trees–seems to have a story to tell. Of course, the incredible food scene and proximity to three gorgeous beaches doesn’t hurt either. In our previous three trips to the city, the Mr. and I were always alone, so I was excited and a tad nervous to bring our two year old along this year. Thankfully, I had nothing to worry about. 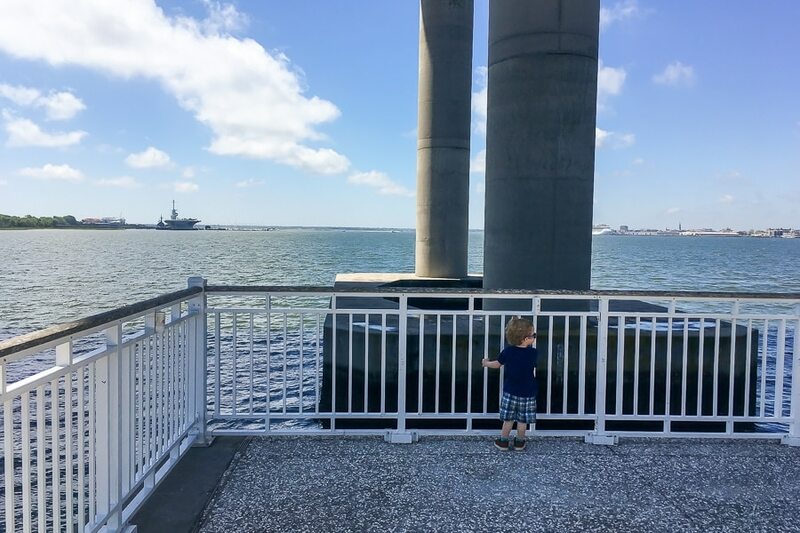 There are LOADS of fun things to do in Charleston with kids, many of which are absolutely FREE. We also found it was quite easy to enjoy Charleston’s great food scene, even with a toddler in tow. 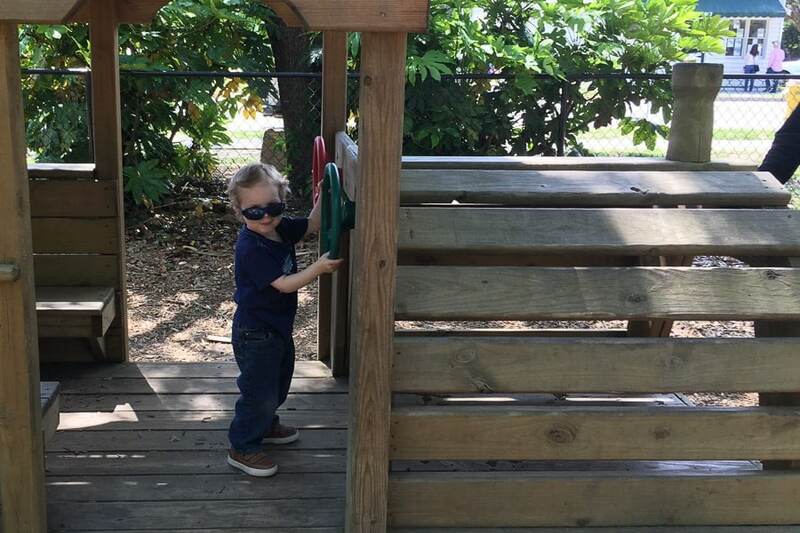 Visit: McMahon Park and Playground– This gorgeous park was a wonderful surprise. Sitting in the middle of what looks like a bit of a sketch neighborhood on the north side of Charleston, this park has a shady, nice sized playground and a beautiful park area with tree lined walking paths, a large gazebo, sculptures and more. This is the perfect spot to grab a picnic lunch or climb a tree. Bring the bubbles along and let the kiddos run! 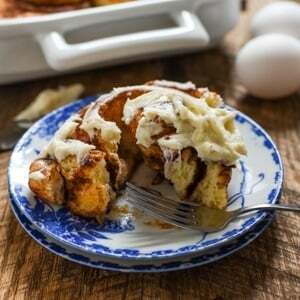 Eat: Callie’s Hot Little Biscuit– Located just five minutes from the park, this popular Charleston hot spot has perfected the art of the biscuit. They have about 10 different flavors of biscuit—including bacon and black pepper, cinnamon, cheddar and chive, and so many more. At $5 for 3 biscuits, you can easily sample a variety. 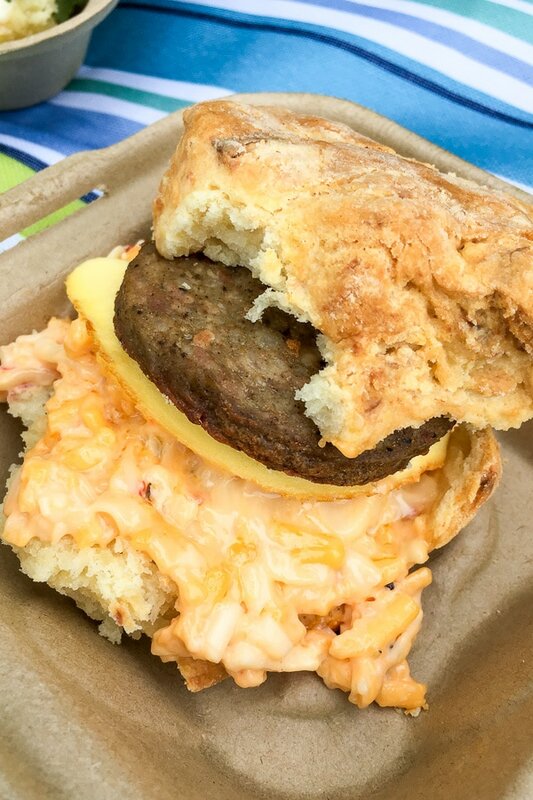 If you’re hungry for more, grab one of their awesome biscuit sandwiches, or add a side of sausage gravy. The lines here can get LONG, so I highly recommend downloading their app and ordering online. We skipped the line, grabbed ours to go, and enjoyed a picnic at the park! 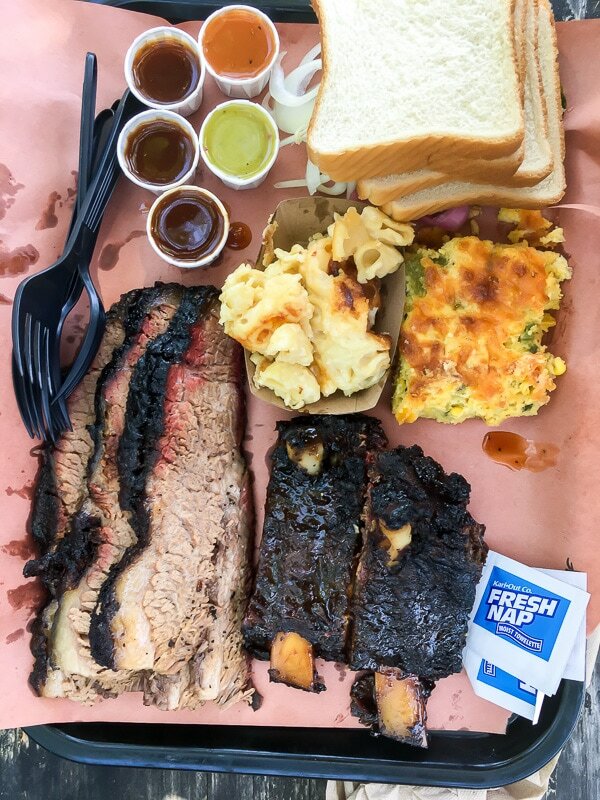 Eat: If you’re looking for something heartier, hit up Lewis BBQ, a must stop for anyone who loves meat (or BBQ). My husband calls their beef brisket “meat butter,” and the beef ribs are outstanding if they have them. Our kiddo is a big fan of the mac and cheese (and let’s be honest, so are we). The casual outdoor seating makes this a nice place to bring the whole family and enjoy the weather. Visit: Sullivan’s Island PARD Park- Cross over the bridge from Charleston to visit Sullivan’s Island, a quirky town with a serious beach vibe. 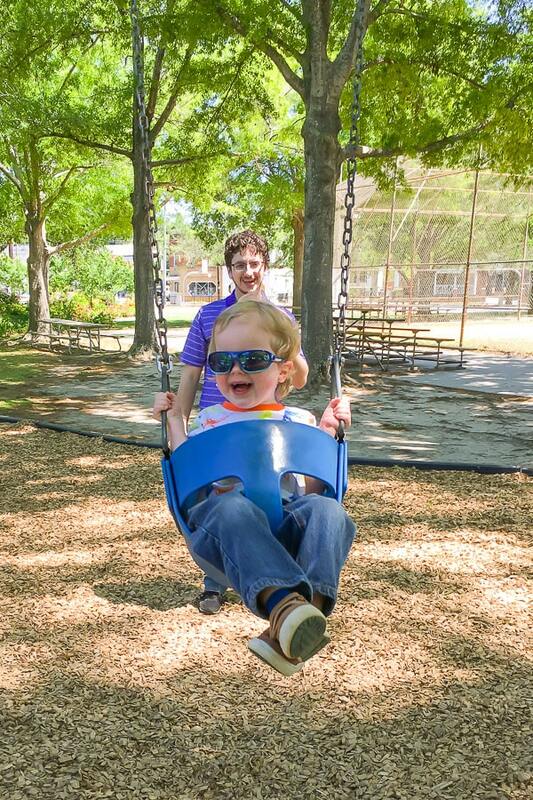 We loved hanging out at PARD Park before we had a kid, and now we love it even more. The park has two large play areas, one designed for younger kids and one for older, along with several basketball and tennis courts. There’s also a gazebo, tables, and grassy areas perfect for picnics. 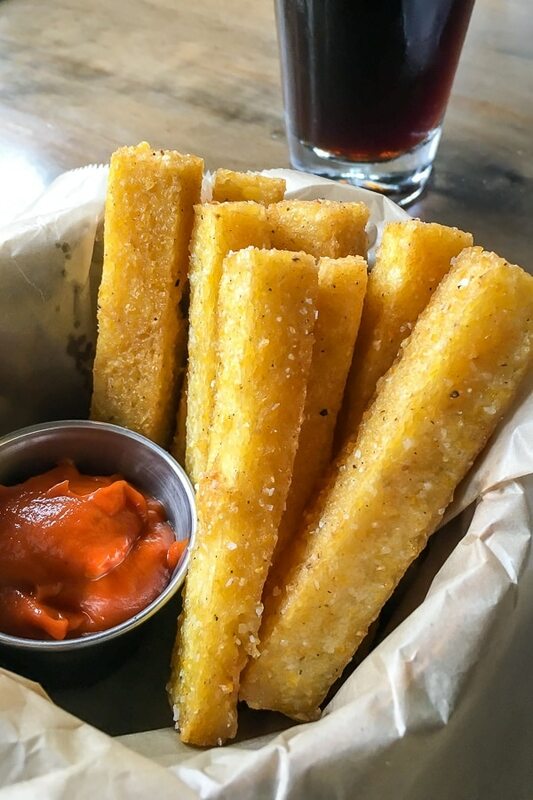 Eat: The Obstinate Daughter– Right across the street from PARD park is our absolute FAVORITE restaurant in the Charleston area. 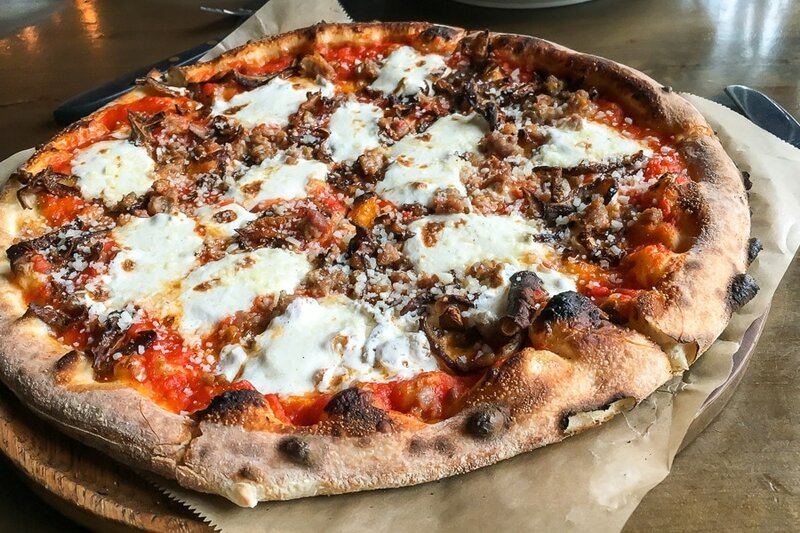 I wouldn’t typically categorize this restaurant as “kid friendly.” The food is definitely upscale and geared towards adults, but if you time it right, it can be a great spot for kids of any age. Everything here is simply fantastic, but the Geechie fries (pictured above) for a starter are a must. I absolutely love their seafood stew, and the whole family enjoyed their flatbreads (pictured below). 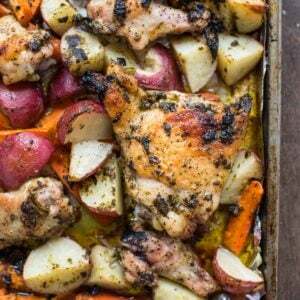 If you see something with “sweet breads” on the menu, don’t ask what it is, just order it! Bonus Eats: Right under the upstairs restaurant is BeardCats gelato shop. They have tons of kid friendly favorites, but my personal favorite is the Olive Oil and Sea Salt. Don’t knock it till you try it. 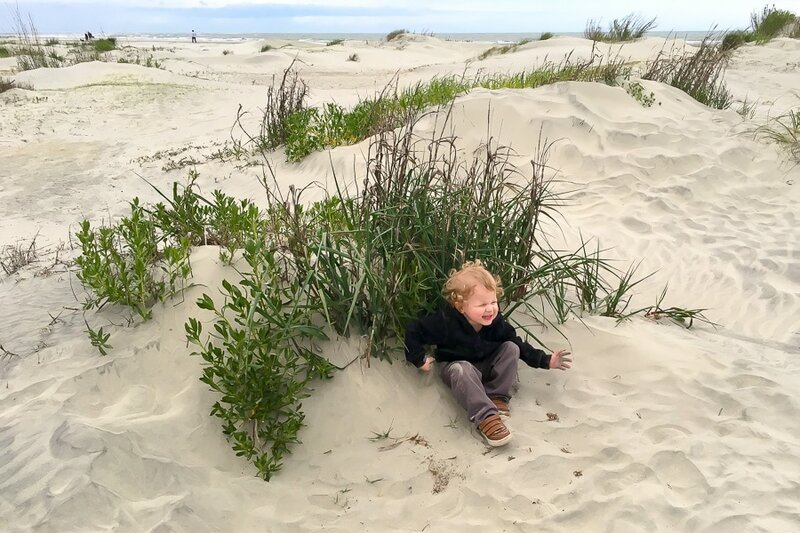 Visit: Sullivan’s Island Beach– I think Patrick would’ve been happy if we had done nothing but hang out on the beach all week long. This is one of two beaches we visit near Charleston (the other being on Isle of Palms), but this one is a little less “official” and generally seems less crowded. If you need public restrooms or food access right on the beach, hit up Isle of Palms. Otherwise, Sullivan’s Island is a great, chill beach for scooping sand castles and splashing in the water for hours on end. 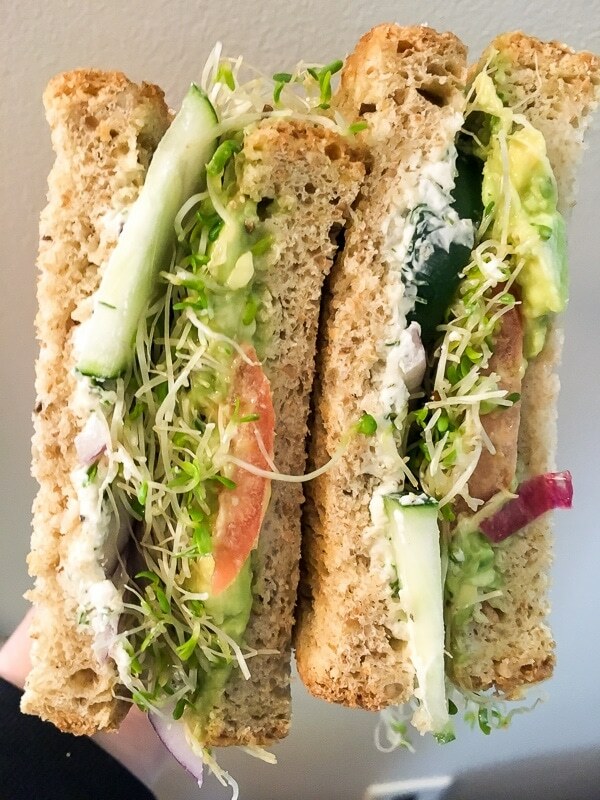 Eat: The Co-Op– Grab a picnic lunch to go at this cute little deli. We all had delicious sandwiches here (my veggie sandwich (above) deserves a special mention), and their giant chocolate chip cookie was (unsurprisingly) a big hit. 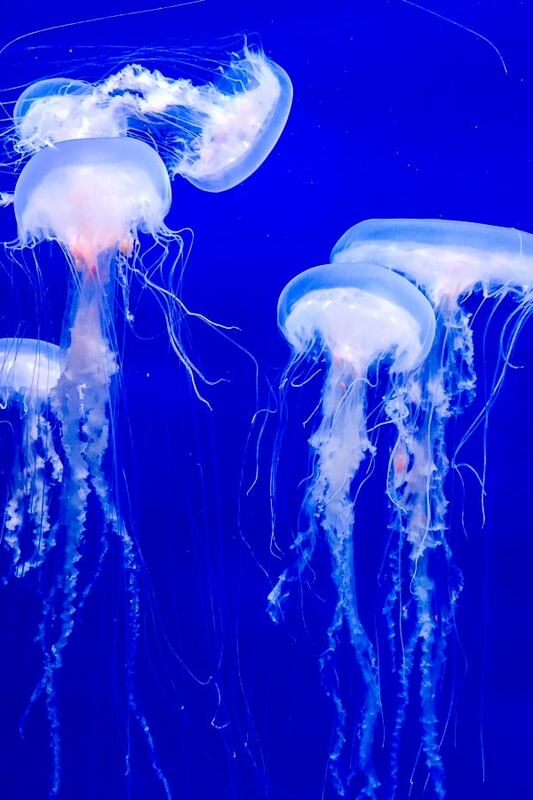 Visit: The South Carolina Aquarium– This is a great spot to spend a rainy morning. We’re pretty spoiled with an awesome zoo and aquarium in Columbus, but this place offered some really unique exhibits I’d never seen before. A two story ocean exhibit, jelly fish tanks, lion fish, and a large touch pond made this a special trip. Eat: Fleet Landing-If you’re looking for a nicer dinner spot that’s still kid friendly, this is a great choice. The restaurant is situated right on the water, so everyone can watch boats coming in and out of the harbor while you eat. 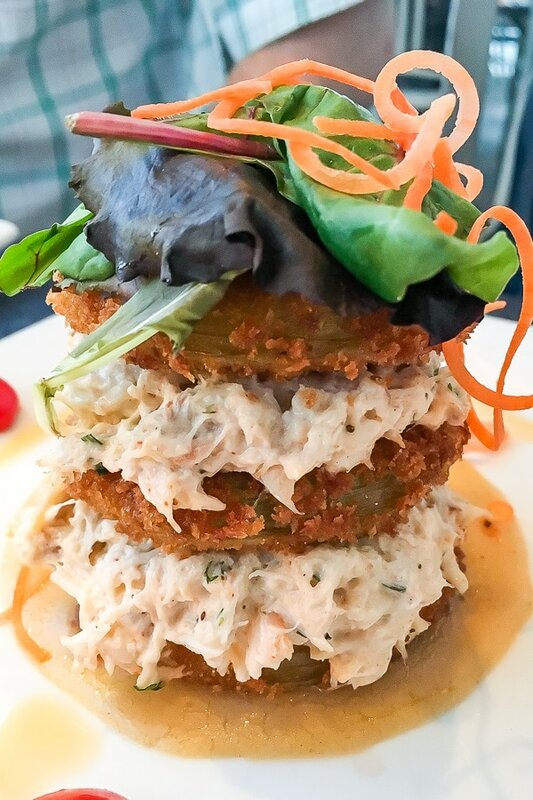 The food is also quite good—we recommend the Fried Green Tomato Stack (above), Whole Flounder, and She Crab Soup! This place is almost always on a wait, so I recommend making a reservation, though passing the time playing corn hole right by the water isn’t the worst thing in the world! 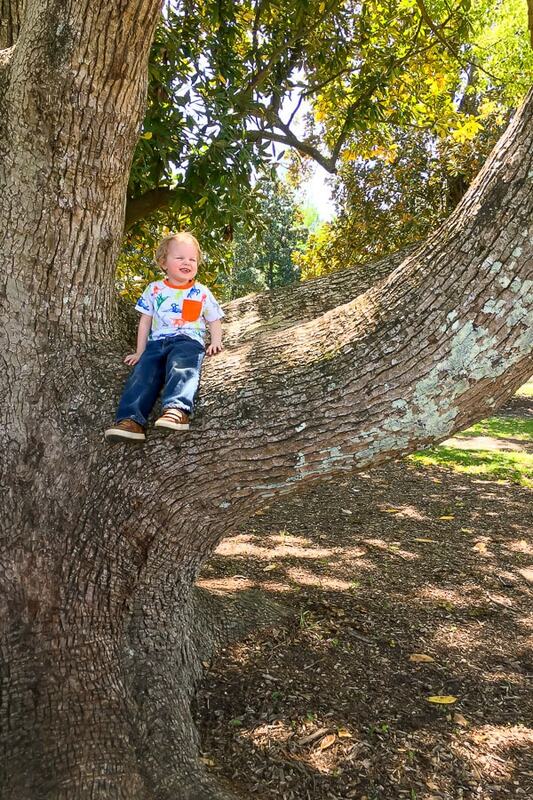 Visit: Magnolia Plantation and Gardens– The gardens alone are enough reason to visit this gorgeous plantation, but a nature train, mini zoo, and tours of the plantation house also offer a lot of opportunities to learn about the history of the area and appreciate it’s various cultures and wildlife. Eat: Glazed–You’ll have to travel north through Charleston to get to the plantation, so why not stop and get donuts for the ride? 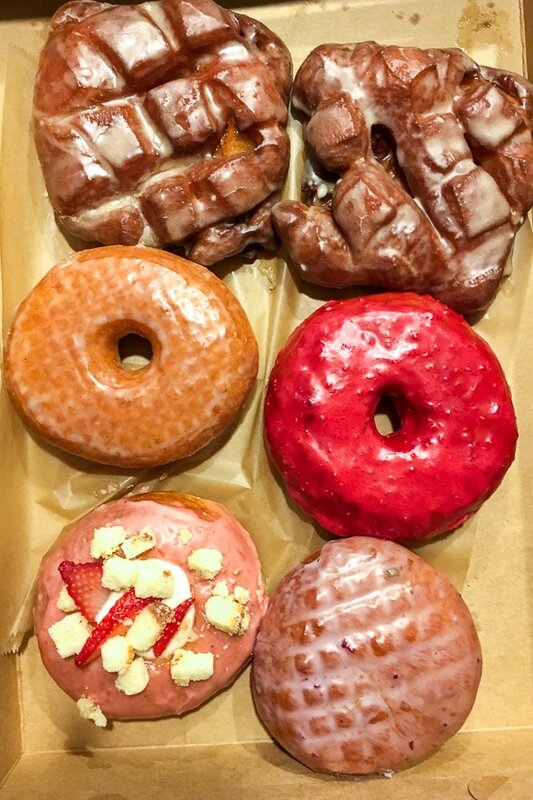 We make a point to visit Glazed every time we’re in the city. Their donuts are some of the best I’ve ever had, and trust me, I’ve had a lot! They often sell out, so it pays to get there early. The Bacon Apple Fritter is a must try! Visit: Mt. Pleasant Memorial Waterfront Park– I really wish we had discovered this awesome park and pier before our last day! Located on the Mt. Pleasant side of the Arthur Ravenel Bridge, this park has a huge playground right under the bridge with areas for younger and older kids, plus a large grassy area which overlooks the water. If you’re feeling like a stroll or a picnic, walk out on the giant peer. There are several picnic tables, giant swings, and a gorgeous 360 degree view. We will definitely be visiting this park many times over in the future! Where to Stay: If you’re wondering where to stay while you’re visiting, there are a lot of options! We’ve stayed in Charleston proper, Mt. Pleasant, and in a condo right on Isle of Palms. Our favorite spot is actually a quiet AirBnB in a residential neighborhood in Mr. Pleasant. The location is super convenient to downtown Charleston and both beaches, but also allowed us to have a back yard and ample parking. 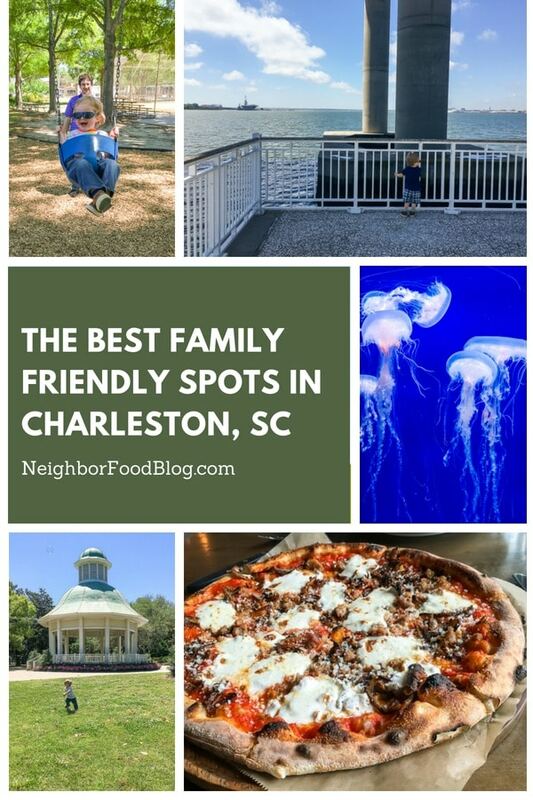 No matter the location around the city, I have no doubt wherever you stay you’ll be smitten with all the family friendly fun, beautiful sights, and amazing food Charleston has to offer! If you have any questions as you plan your trip, leave a comment or email me! I’d love to help! Thank you! I hope you’re able to visit sometime. It really is beautiful!